Holy Smoke! The hobbit might not be human after all! Ordinarily, it’d be just another sway in the ongoing hobbit debate, but this time it’s different. It seems that one of the original discoverers of the Hobbit aka homo floresiensis may be rethinking the idea of the hobbit as a human. 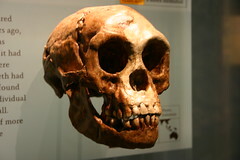 This rethink comes in the face of new discoveries of hobbit bones (a total of six to nine individuals, up from a previous number of one) as well as a study of the mandibles and teeth still suggest that they are nowhere near modern humans, but also differ from the earliest hominins out of Africa (the hominins from Dmanisi in Georgia). Peter Brown, one of the discoverers of the hobbit hominid skeleton from Liang Bua cave in Flores posts a robust -and credible – defence against the charge that the Hobbit underwent dental work. He posts his rebuttal on his website, along with high-resolution photos which you can read here. The tooth, and nothing but!